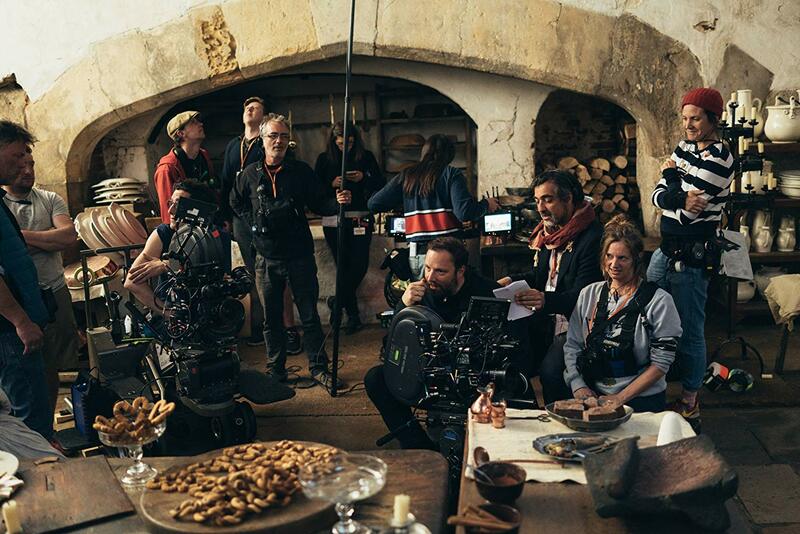 Equal parts exquisitely acted and visually arresting, The Favourite marks a step in a bold new direction for director Yorgos Lanthimos. SARAH: Hell. And I’m sure you shall pass through it one day. “Love has limits,” Sarah Churchill tells her Queen in the opening minutes of Yorgos Lanthimos’s new film, The Favourite. “It should not,” the queen retorts. So sets the stage for Lanthimos’s new film, a meditation on love, what it means to want it, to have it, and to live a life without it. The standard rhythms of Anne and Sarah’s everyday court life are disrupted with the arrival of Sarah’s cousin Abigail Hill (Emma Stone, La La Land) who seeks employment at the castle. Abigail is a former lady herself, but after years spent with an insane father and the German husband who claimed her as payment of her father’s gambling debts, her station has fallen so low that she’s willing to take employment as a mere scullery maid. Sarah, however, has her sights set much higher, flattering and scheming her way into the Queen’s inner circle – and perhaps even deeper yet. Abigail seems everything Sarah is not, a fun and flattering breath of fresh air to Sarah’s cool levelheadedness, but behind her youthful exterior is a conniving heart willing to play up her better attributes to earn favor. When Anne tries out a new makeup style Sarah is the one to tell her she looks like a badger. Abigail just wants to flatter. While Anne would be content watching duck races all day, Sarah is the one to remind her of the importance of running the government with a logic beyond appeasing whoever spoke to her last. Sarah is an important part of making Anne’s life as queen possible, but that doesn’t mean she doesn’t sometimes feel like a schoolmarm. How easy it is then for Anne and the audience to identify with Abigail — if Anne just wants to eat cake and attend parties, it’s not because she’s an inept ruler, but because she’s been beset by tragedy. She’s hobbled by excruciating spells of gout and haunted by the loss of her seventeen failed pregnancies that have left her lonely and heirless. She shares her bedroom with seventeen pet rabbits, one for each lost child, these traditional symbols of fertility instead existing as symbols of her grief. Fisher King interpretations abound. Abigail seems so fresh and bright. While the trouser-wearing Sarah spends her free time shooting trap, Abigail is more likely to be found reading in a tree. She’s just the thing to shake up the queen’s doldrums, and it comes as no surprise when Sarah and Abigail being competing for the queen’s favor, gossiping, backstabbing, and doing whatever it takes to stand at the queen’s right hand. It’s impossible to heap too much praise on the film’s three female leads who take to this project with obvious delight. It’s eternally easy to lament the lack of strong female roles in modern film, so when something like this comes along it has to be a joy for actresses of this caliber to sink their teeth into parts this meaty. Colman and Weisz are both reuniting with Lanthimos after their previous work together in The Lobster, and Stone seems right at home adapting to their chemistry. If she seems at all like an outsider it only serves to underline her character as an interloper at the film’s outset. I’ve never been a huge fan of Stone’s work, but here she unveils new layers beyond being a plucky romantic lead. She knows how to play acidic, and it really works in what’s her best performance since Birdman. Colman is the only non-Oscar winner of the three, but she’ll be making a strong push this year for her performance as the insecure queen balancing her pain with a desire for love and admiration. It’s a hard combination to be both funny and sad, but Colman, one of England’s greatest television actors of the last decade, pulls it off with aplomb. I expect all three of them to earn Oscar nominations. It’s just a matter of who goes in what category. I see Weisz and Stone as co-leads with Colman doing a major supporting offering, but who knows? Don’t be surprised if Nicholas Hoult joins them as a nominee. He’s great as the Whig politician attempting to work Abigail’s newfound favor into his own gain. After the dual successes of his first two English language films, The Lobster and The Killing of a Sacred Deer, The Favourite marks a step in a new direction for Yorgos Lanthimos. It’s the first of his films that he and Efthymis Filippou did not write together, which would revel in the pair’s penchant for stilted dialogue that Lanthimos used to investigate absurdism. Favourite co-writers Deborah Davis and Tony McNamara don’t share Lanthimos’s linguistic tics, fashioning a script that could have been a much more direct story of palace intrigue in the hands of another director. The Favourite gets its laughs from quips and wit instead of Lanthimos’s trademark absurdist nihilism. Anne, Sarah, and Abigail talk and act like actual humans, and the film, despite its eccentricities, is all the more grounded for it. None of which should give pause to Lanthimos fans. 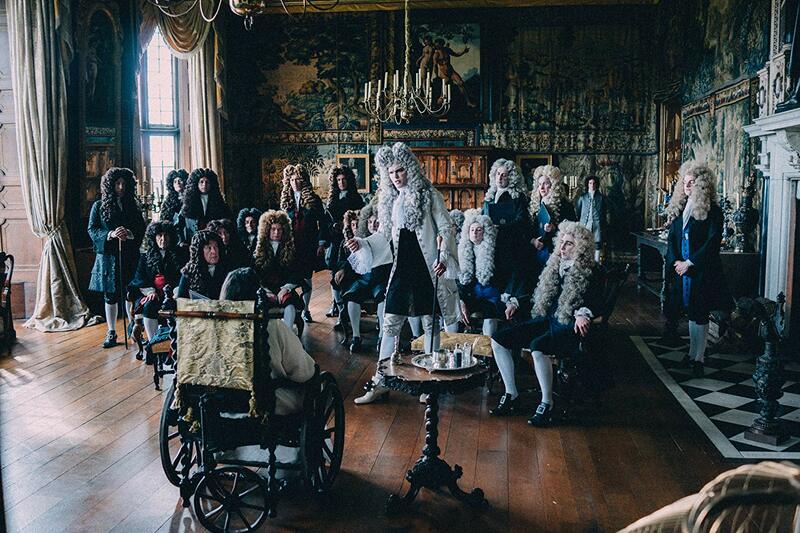 While The Favourite marks a difference in style, his fingerprints are still all over the film which maintains his penchant for having characters deliver blistering dialogue with stoney poker faces. The Favourite is an absolute riot with Weisz and Stone sniping back and forth at each other for two hours. 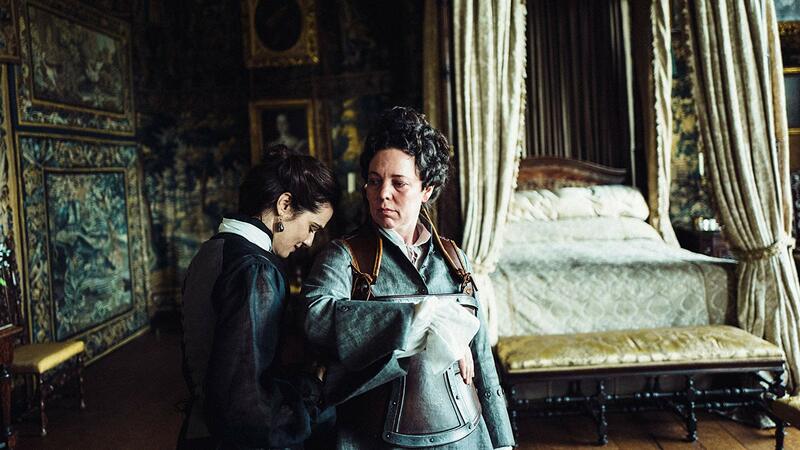 Lanthimos might have traded his minimalistic European settings for the pomp and circumstance of an English castle, but, despite the buttoned-up setting, The Favourite is perhaps the bawdiest film he’s ever made. It’s laugh out loud funny while still retaining the awkward laughs that are a Lanthimos trademark. The duck races and a scene featuring some anachronistic dancing are a riot. Sandy Powell’s costuming and Robbie Ryan’s cinematography contain volumes. I’ve already written about Sarah’s gender-bending trousers. Abigail is frequently dressed in an equally smart peacock blue dress, a symbol of her youth and fertility. Ryan is sure to collect accolades for his natural light photography and clever use of fisheye lenses. The film vacillates between shots of daylight pouring in through the historic Hatfield House’s enormous windows and night scenes illuminated by candlelight, and combined with the costuming, make this easily Lanthimos’s most visually interesting film. Ryan uses the fisheye lens to give us wider shots of the castle’s constricting rooms, and the effect is of Abigail, Sarah, and especially Anne looking like, as Lanthimos has said, “lonely characters in huge spaces.” Just like the rest of the film, it works. The Favourite is a huge step forward for a director whose work had become too dour and formulaic for some. The film is an exploration of grief and love, often in concert with one another as Sarah and Abigail’s devilish behavior finds them in both a figurative and literal love triangle with the powerful woman they desire to stand beside. Both sweet and sinful, it’s a wickedly delicious cake of a film, and one likely to being Lanthimos a wider fan base. He deserves it for this masterwork. And if, like me, you’ve always loved Lanthimos, don’t worry. You’ll still be laughing, and for once you won’t be laughing alone.